As related by Cavaliers founder Don Warren, when the corps directors who founded Drum Corps International were having their first meeting in Indianapolis after the 1971 season, the question was asked what this new organization should be named. Someone wrote "Drum Corps National" on the chalkboard, prompting the representative from the Canadian DeLaSalle Oaklands to ask, "What about us?" The prefix "Inter" was then added to the name, and thus DeLaSalle literally put the "I" in "International." After DeLaSalle finally became a DCI World Championship Finalist in 1974, in seventh place, the corps merged with the Etobicoke Crusaders to form the Oakland Crusaders. The new corps made the 1975 and 1976 Finals in sixth and eighth place respectively. The following year, DCI Hall of Fame member Tom Float (who later worked with Spirit of Atlanta and the Blue Devils) took the corps' drum line all the way to first place at the 1977 World Championships Prelims in Colorado. Unfortunately, the rest of the corps didn't do so well and Oakland finished in 15th, the only time a section of a DCI World Class corps finished first in a Prelims caption while the corps itself didn't advance to the Finals. WWith the wind seemingly knocked out of them, the corps lasted three more years in World Class, in 17th, 25th and 32nd place, and then went inactive until 1986, at which point the corps returned for seven years as a Division II&III group. The corps' 1976 show opened with Tchaikovsky's "Swan Lake," went into a drum solo and a screaming rendition of Louis Prima's "Sing, Sing, Sing," before hitting the concert number of Bill Holman's "Malaga" (written for the Stan Kenton Band) and finished with Chuck Mangione's "El Gato Triste." 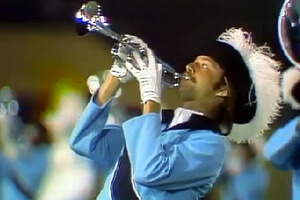 Three of the selections (all except "Sing, Sing, Sing") had appeared in the corps' 1975 show. This was still an era when corps could keep major chunks of their show from one year to the next and few people seemed to care. The only new piece from the year before was Louis Prima's "Sing, Sing, Sing," which replaced Gustav Holst's "Jupiter" (from "The Planets"). Performance excerpt of the 1976 Oakland Crusaders. After a flurry of spinning rifles and flags on the 50-yard line, "Swan Lake" began with a quick build into a vivacious troop on the stands, followed by the ballad theme that most people think of when they hum something from the ballet, ending with a big bang thanks to the power of a horn line that wasn't afraid to cut loose. Just before the contra (tuba) feature in "Sing, Sing, Sing," you can hear drum major Joel Alleyne yelling, "Get Down!" Alleyne often talked to his corps during a performance, loud enough for the audience to hear, and his antics made him the best-known drum major of the era. In the DCI's 1976 program book publication, Alleyne was quoted that a drum major "must be aware of the spectators. The audience must feel that the drum major is in control of his corps and he must at the same time put on another type of show—a show for the crowd." Alleyne's reaction at the end of "Sing, Sing, Sing" was unique to his style; he didn't turn to acknowledge the crowd. Instead, he jumped off the podium and strutted a little, giving off a vibe of being "too hip for the room." The audience ate it up. He then hopped on the podium for the concert production of "Malaga" and, finally in recognition of the cheering fans, wiggled his torso before starting conducting the standstill production. He went on to become an extremely successful consultant and researcher in Toronto as well as an instructor in medicine at the University of Toronto. The show closed with "El Gato Triste," building into a segment where the horns closed in to each other on the 50 and then expanded in an opening "X" formation, a trademark of drill writer Larry Case. At the conclusion of the show, a jubilant Alleyne yelled in satisfaction, jumped off the podium and walked back to the snare drummers, perhaps forgetting to acknowledge the audience, or perhaps just being too darned cool to do so. This week only, you can save on 1976 World Championship Audio and Video Performance Downloads on the DCI Fan Network. Buy the 1976 Oakland Crusaders Video Performance Download. (Available this week only for $3.99. Regular price: $4.99.) Buy the Audio Performance Download bundle of all 12 Finalists from 1976. (Available this week only for $15.99. Regular price: $19.99.) Offer ends Monday, May 9 at 8:30 a.m. ET. [pic_2] Michael Boo was a member of the Cavaliers from 1975-1977. He has written about the drum corps activity for more than a quarter century and serves as a staff writer for various Drum Corps International projects. Boo has written for numerous other publications and has published an honors-winning book on the history of figure skating. As an accomplished composer, Boo holds a bachelor's degree in music education and a master's degree in music theory and composition. He resides in Chesterton, Ind.